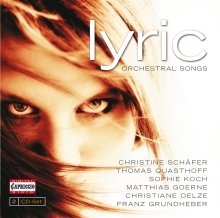 Not only a celebration of distinguished voices: This 2CD-album of recordings taken from the legendary Capriccio-Archive joins some of the world’s leading singers together and simultaneously presents a broad repertoire of known and unknown songs for orchestra as well as some songs yet to be discovered. 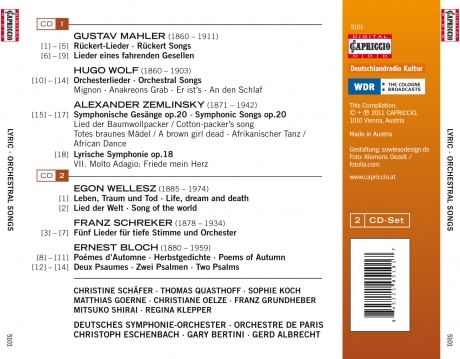 Besides the Rückert-Lieder and the Lieder eines fahrenden Gesellen by GUSTAV MAHLER, also the Symphonischen Gesänge op.20 by ALEXANDER ZEMLINSKY, the 5 Gesänge für tiefe Stimme by FRANZ SCHRECKER and HUGO WOLF’s 5 Orchesterlieder are assembled on this recording, as are the hitherto little known musical versions of lyrics by EGON WELLESZ and ERNST BLOCH. Renowned conductors such as CHRISTOPH ESCHENBACH, GERD ALBRECHT or GARY BERTINI guarantee the quality of the artistic realisation of these complex scores.